Build Quality (6/10): The Denons are made entirely of plastic, including the headband, and don’t feel as solid as I would like. Molding artifacts and visible seams abound. On the upside, the swivel hinges on the cups and 3rd hinge in the headband mean that they can fold into a very tiny package – extremely convenient for use on the go. A small velvet varying pouch is included with the phones, as is an extension for the tiny (50cm) cable. With the extension the cable is average in length but feels a little cheap. It’s thin, plasticky, and has a lot of memory character. It kinks quite a lot, especially when stored wound up. Cable entry strain reliefs are also too hard for my liking. Comfort (8/10): The cups of the AH-P372 are medium in size, similar to those on the AKG K81DJ, and outfitted with soft pleather pads. The pads on the headband do their job as well. Clamping force not excessive as on the AKGs but not completely unobtrusive, either. They are tolerable for some time but there may not be enough clamp in them for persons with very small heads. Isolation (6/10): Isolation is on par with the majority of the competition. It does a good enough job of muffling external noise when music is playing but won’t make you completely oblivious to the outside world. 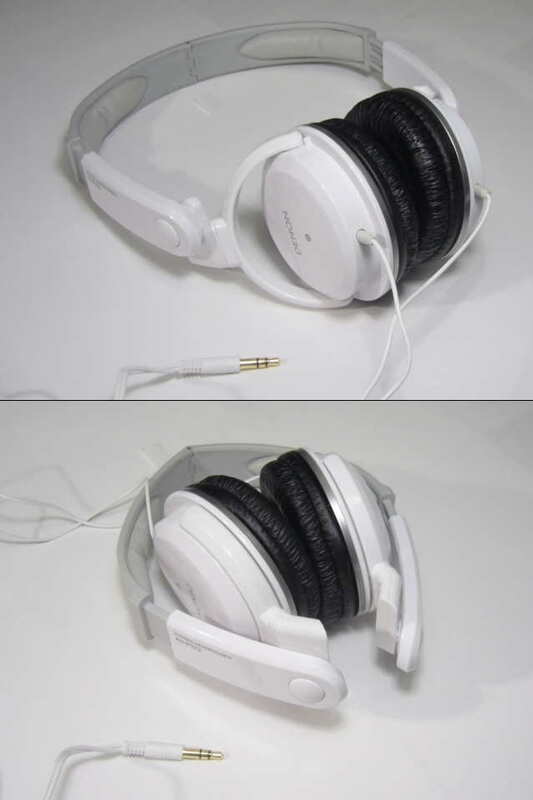 Sound (6.25/10): The overall signature of the AH-P372 is rather balanced and neutral. Nothing jumps out at first listen and yet nothing is notably missing. The low frequencies can deliver a good amount of impact when called for but are never excessive or intrusive. The midrange is very clear but can sound a bit flat and dull, almost recessed. Because of this I sometimes found myself cranking them up a few notches above my usual listening volume to bring out more mid-range detail. Vocals do have good texture and decent air; I just wish I could hear more of them. The treble is energetic but not at all aggressive. Harshness and sibilance are not present but the headphones can sound “plasticky” at times. Soundstaging is average, with decent instrumental separation on all but the densest tracks and good spatial tracking. I also found them quite revealing of poor sources and recordings – the AKG K81DJ played much nicer with 128k mp3s and my netbook’s headphone out. Value (7.5/10): With their balanced sound, solid comfort and isolation, and decent build quality, the ‘baby Denons’ are worthy competitors to the likes of the K81Dj and Sennheiser PX200. They’re not as visceral as the AKGs or as tight and accurate as the Senns but sound very good in their own right. As far as supraaural portables go, they definitely earn their price.